New Delhi, India, April 16, 2015 – LocalCircles (https://www.localcircles.com/a/), India’s leading Community Social Media network today announced that it has recently concluded a large community poll to better understand the state of Telecom Services in India. With approximately 20,000 citizens responding to each one of the 6 poll questions, the Telecom poll provides quantitative insights into the quality of telecom services in India, the citizen grievances and India’s stand on Net Neutrality. In addition to the poll, detailed structured discussion was conducted on Telecom Issues, Root Causes and Solutions that are needed to improve the state of Telecom Services in India. The poll and structured discussions were conducted in the 200,000+ strong community “Transform India with Modi” which focuses on giving collective citizen inputs on Governance and Development of India to the Government. According to the collective view of the community, immediate efforts are needed by the Telecom Regulator and the Operators to improve the voice and data service quality by reducing call drops, improving coverage and quality. Citizens also want the Telecom Regulator to establish/enable a robust consumer grievance mechanism with effective processes in case the consumer is not able to resolve the matter with the telecom operator. Net Neutrality is something that the large majority of the citizens support and want the telecom regulator to ensure consumer interest is protected at all costs. Overall, the regulator should work towards taking some immediate steps to improve quality of telecom services and the consumer confidence in the regulator and telecom operators. 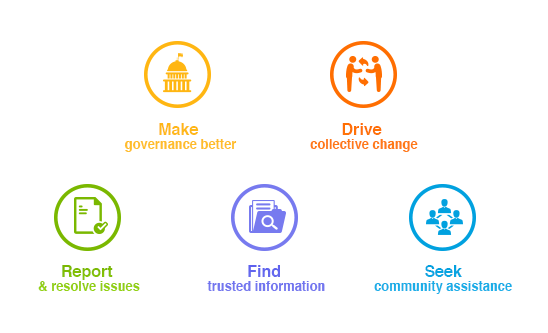 The Transform India with Modi circle was initiated in May 2014 upon the election of the new Government of India to enable citizen participation in governance. With over 200,000 citizens actively giving inputs on various subjects, the community has generated over 40 whitepapers in the last 12 months and submitted them to various Central Government leaders and Ministries.